I am a stationary junkie! I LOVE beautiful stationary. I mean I can’t get enough. 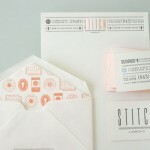 I can’t contain the squirms and squeals of glee when I see a clever or exceptionally beautifully branded paper suite. Here are a couple that I’m drooling over today. In this day and age, so many things are powered or charged by way of usb – the obvious example is a cell phone. If you’re like us, you’re frequently trying to get in to the few unused outlets in your tiny apartment before the other person does so you can charge your device.